I love that feeling when you try something you're skeptical about and you find out that you are actually pleasantly surprised with it! Do you know that feeling? That's what happened with this product - I thought the idea of a stamping guide was pretty dumb at first, but now that I've tried one I'm a total convert! They work so well, and I can think of so many ways to use them! Imagine that!! 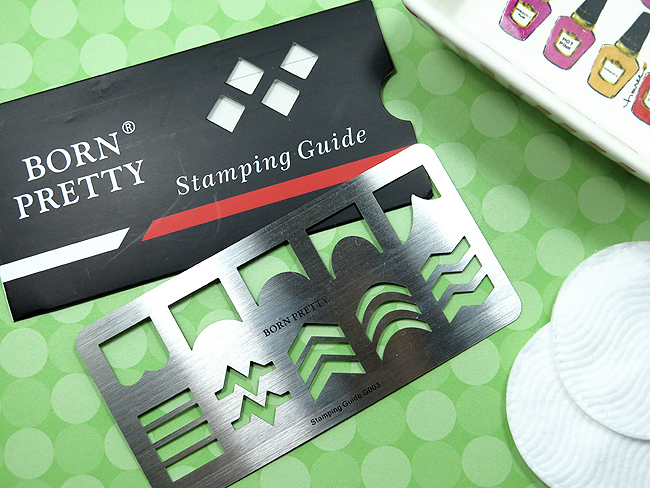 Today I'm reviewing Stamping Guide 003 from Born Pretty Store which is currently on sale for $3.99. What this is is a thin metal sheet with cut shapes that you can place over your stamping plate to pick up only select parts of the image. As you can see above this particular guide has a variety of shapes on it - zigzags, french tip guides, lines, and a bunch of other options. This was SUPER simple to use. You paint and scrape your stamping plate as usual, place this over the part you want to pick up, and then use a semi-squishy or marshmallow stamper over it all just like you would normally pick up your image. The plate is thin enough that it doesn't interfere with the ability to pick up the image too much unless you use a firm stamper that doesn't sink into the grooves. I found that firm stampers didn't flatten enough into the image to pick it up so if you have a few stampers you'll want to experiment to see which ones work best for this process. 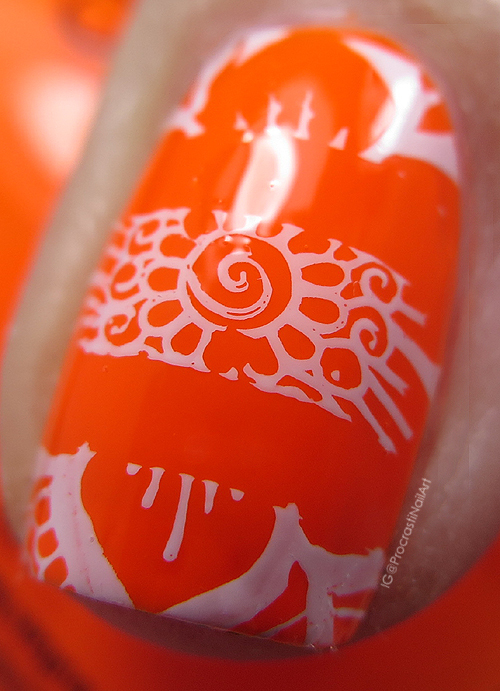 When you're done clean it up with acetone just like you would do with your stamping plate and you're good to go! 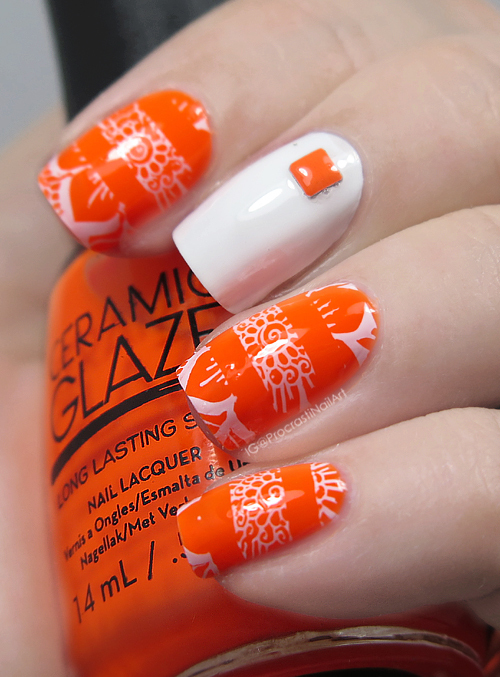 Now, let's take a look at a mani I did with this stamping guide using the striped lines section.. I started off with a base of Ceramic Glaze Solar Radiance which is a neon orange - please excuse my camera as this polish didn't want to play nice so the warmth changes from shot to shot! When the base was totally dry I took my stamping plate and my Mundo de Unas White and prepped my plate before placing the stamping guide over top. I picked up the image, applied it to the nail, and then applied top coat to smooth the whole thing down when it was dry. 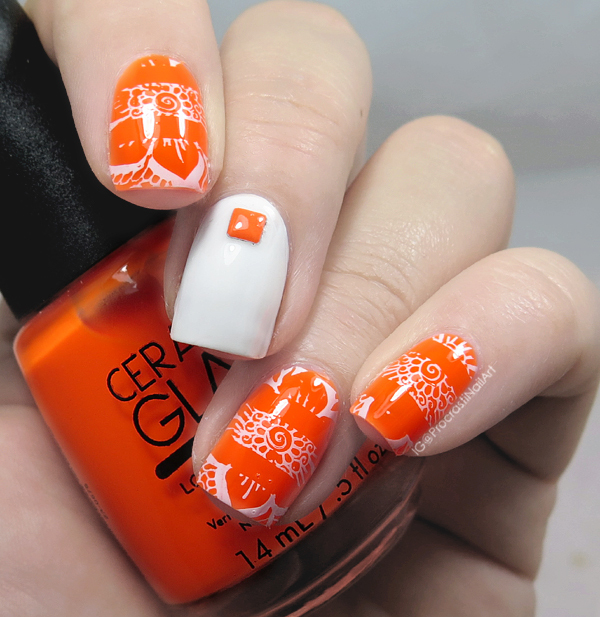 For my accent nail I used a base of Sinful Colors Snow Me White and applied a neon orange stud. I love how crisp the lines turned out, and I will definitely be using this guide more in the future! I already have an idea for a fun stamped tip mani I want to try! As mentioned above you can get Stamping Guide 003 (or any of the other three guides) on sale right now for $3.99, but even when they aren't on sale you can get them (or any other products!) at a discount with my code ASZW10 for 10% off! Those stamping guides seem to work really well. I like the final outcome too. I was skeptical about these but every post I've seen indicates they actually work pretty well! I've been considering getting something like this because vinyls hate me. Thanks for the review. I picked up some stamping guides from Bundle Monster a few months ago but have yet to use them. You've inspired me to pull mine out and experiment. What an interesting concept. I'm glad this is so easy to use! Seems simple enough but I know I'd be the one to totally fail at using a stamping guide.